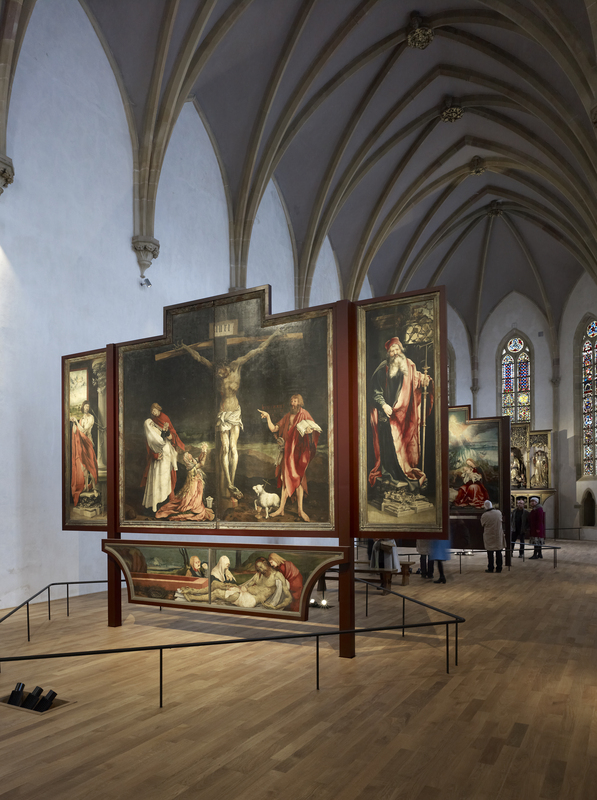 With the exception of certain holy days, the wings of the altarpiece were kept closed, displaying The Crucifixion framed on the left by the martyrdom of Saint Sebastian pierced by arrows, and on the right by Saint Anthony, remaining placid although he is being taunted by a frightening monster. The two saints protect and heal the sick, Saint Anthony as the patron saint of the victims of Saint Anthony’s fire and Saint Sebastian, whose aid was invoked to ward off the plague. Grünewald’s Crucifixion stands as one of the most poignant representations of this scene in Western art due to the artist’s masterful depiction of horrific agony, with Christ’s emaciated body writhing under the pain of the nails driven through his hands and feet. This body covered with sores and riddled with thorns must have terrified the sick, but also left no doubt about Christ’s suffering, thus comforting them in their communion with the Saviour, whose pain they shared. Mary, the mother of Jesus, is shown at Christ’s right, collapsing in anguish in the arms of John, the beloved disciple of Christ, and shrouded in a large piece of white cloth. At Christ’s left, John the Baptist is accompanied by a lamb, symbolising the sacrifice of Jesus. The presence of John the Baptist is anachronistic. Beheaded by order of Herod in 29 AD, he could not possibly have witnessed the death of Christ. This last figure announces the New Testament by crying out, “He must increase, but I must decrease.” The inclusion of John the Baptist in this scene is symbolic, since he is considered as the last of the prophets to announce the coming of the Messiah.